Our amazing iPad app: photo books at your fingertips! Now you can create amazing photo books on-the-go with our new, easy to use iPad app. So rather than ease into a good book this summer, you could create your very own photo book instead – anywhere, anytime! To get started simply download it for free from the app store here. Once up and running you’ll have your photo book created in no time! Just like online, there’s a large range of layouts to choose from, plus an inspiring mix of effects and filters to give you the freedom to add those personal touches. And you can even add captions in different fonts. As you would expect, we’ve made it really simple to import all your favourite images from Facebook, Instagram, Dropbox and of course, your iPad. Getting them exactly as you want them on the page is just as easy, with a simple swish of the finger. Once you’ve completed your photo book you can share it with friends and family right from the app – so everyone else can enjoy your masterpiece! 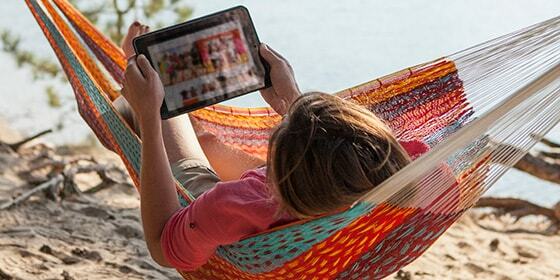 Perfect for lazing on the beach or perhaps the flight home from paradise, get creating on our free iPad app today. What will you create? To go straight to the app store, just click here!